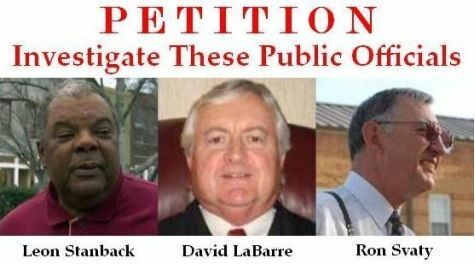 On 8/27/2013, the objective was to email in aggregate 2,000 signed petitions by 9/30/13 to 10 decision-makers (e.g., Governors, US Senators, Attorneys General), requesting that they commission an investigation into the criminal misconduct of three public officials in two states (Leon Stanback and David LaBarre of North Carolina and Ron Svaty of Kansas). These petitions contained links to overwhelming evidence supporting the damning indictments. This objective was exceeded in one week. Reflected below is the actual petition, along with additional comments made by those who signed the Petition. Ignoring this is NOT an option, so phone calls demanding action were made to each office today. And to access this petition click here. The district attorney of any municipality should NEVER arrest innocent US citizens (particularly those who are victims of crimes) on fabricated charges, incarcerate them with violent felons, and unlawfully deny them bail, in order to cover up the crimes of a friend, especially if that friend is a sitting judge. This is an abuse of public trust, and this matter calls for investigations into the associated: (1) assault on civil liberties; (2) willful misconduct & crimes of public officials; (3) unlawful search and seizure; (4) failure to return stolen property; and (5) fraudulent claim & unresolved ethics complaints. Importantly, while these investigations are warranted on the merits of their own facts and circumstances, they appear to be linked, and suggest a scandal of great significance, as covered in Mr. Young’s Aug. 20, 2013 Press Release (http://tinyurl.com/mezs5a7). Based on the Sworn Affidavit filed on Aug. 20, 2013 (http://tinyurl.com/kouzzn3), I support an independent investigation into Spencer C. Young’s wrongful arrest in Florida, and ensuing fraudulent extradition to North Carolina by Durham, NC District Attorney Leon Stanback. Mr. Young’s arrest was predicated on false charges that were later dismissed as meritless; however, not until Mr. Young had spent 127 days in maximum security jail. Such an assault on American civil liberties is beyond disturbing. Based on the Criminal Complaint filed on July 2, 2012 (http://tinyurl.com/msd2q49), I further support an investigation into the abject failure to prosecute the criminal charges Mr. Young had filed against Durham, NC Judge David Q. LaBarre and his accomplices, involving grand larceny, fraudulent conversion and automobile theft in North Carolina. This appears to be an alarming instance of willful misconduct by the DA Stanback, the Durham Police Department and likely others. During his unlawful incarceration, Mr. Young’s residence in Florida was subjected to an illegal search predicated on a Bogus Search Warrant (http://tinyurl.com/m7aogh8) and resulted in the wrongful seizure of all of his computer equipment, which has effectively become a grand larceny theft because after more than a year later, his computers have still not been returned. Mr. Young contends the intent of absconding with his computers was to suppress evidence against Mr. LaBarre and his accomplices, and I support the immediate and unconditional return of ALL of Mr. Young’s Stolen Property (http://tinyurl.com/mdz68jz), including that which was stolen by Mr. LaBarre and his accomplices. I also support an investigation into what appears to be a Fraudulent Paternity Claim emanating from a state located over 1,000 miles away from all parties involved (i.e., Kansas), the timing and legitimacy of which is especially suspicious, since it was filed by the primary accomplice in Mr. LaBarre's alleged North Carolina felonies. Concurrent with this should be an investigation into the multiple ethics complaints filed against the rural Kansas judge involved (Ron L. Svaty), the first of which was filed on September 1, 2011 (http://tinyurl.com/7p83j3p), and oddly ignored. I strongly urge you to commission these investigations. I believe they will show Mr. Young was the victim of numerous crimes and civil rights violations perpetrated by wayward public officials in North Carolina and Kansas who have abused their authority and violated the public’s trust. Moreover, the results of these investigations may lead to revelations of greater wrongdoing, which I understand are covered in explosive detail in Mr. Young’s upcoming exposé, “Cannibals In White Shoes”, scheduled to be published in the Fall, and further detailed at CannibalsInWhiteShoes.com. I Hate White Collar Crooks. I have been the victim of such corruption and can stand it no more and we must continually fight [these] scum and support each [other]. We MUST rid our Government from these parasites, it seems the parasites have taken over Washington! Main problem with government today is the lack of accountability. Investigate NOW! This is an abuse of power meant to silence those that expose the truth. Government exists because of the people. We created government. They are servants of the people who elect them and not our masters. I must fight for civil liberties to be protected in order to ensure mine stay protected. I want the moral fibers of our Nation restored. This is a step in the right direction. Corruption must be stopped if Democracy is to continue. Corruption is rampant, innocent people suffer daily as a result. It's time to turn the damn tables and make the corrupt cringe for a change. End the corruption or the TRUE Patriots WILL do it for you!! These actions of corrupt officials, judges and people in power have to be investigated by unbiased officials.. The perpetrators usually get off with a pat on the back.. the good ol' boys have been doing this for a long time.. It needs to stop.. It is a pitiful state of affairs when an average citizen is victimized by the system and re-victimized, over and over.. I am an older woman and have never done anything illegal but I am wary of the justice system. I am afraid of people who have more power than intelligence, more clout than morals and no ethics at all. We should all be outraged and demanding investigation and justice in all such cases. Bankers need to be held accountable for their Ponzi scheme. Corruption in public offices needs to end. "We must get back to the fundamentals of a free society, one being ""Justice for all"" !!!!!!!! No exceptions ! North America needs an HONEST justice system, not full of crooks and cronies doing their thievery. Corruption in government must be stopped, it is out of control. Corruption in government is an affront to democracy WHEREVER it is practiced. The violation of every individual's rights is the problem of the whole society. Public officials MUST be beyond reproach! We must have honest and transparent government that works FOR the people NOT against them. These Crimes must be Justified! No exceptions! Violation of public trust and abuse of power and office can never be tolerated. Sick of all the corruption in public offices, especially the ones in the white house. Officials should be protecting the public- NOT being or (becoming), the public’s problems & nightmare~!!!! Simply fed up with all the lies & criminal behavior of politicians, and general injustice in the world today!!! Because I believe in JUSTICE for ALL. Because they have been found to have been committed fraud. The ongoing and expanding transgressions of private money interests have destroyed America. We have been overthrown by corporate lust for excess. Our forefathers tried to create a Democracy, but we have soiled it. Now it's a Hegemony. Because a citizen requested it. Because I'm a U.S. Citizen.